Wah Maker suspenders Made to pair with the frontier pant Sturdy Canvas & leather Y-back suspenders Attaches to frontier pant buttons Adjustable for a great fit When wearing chaps and a gun belt, you'll appreciate the comfort of these adjustable dress suspenders. The Military Suspenders Rough Riders is a Calvary Braces braces by Wahmaker's Vintage Western collection. 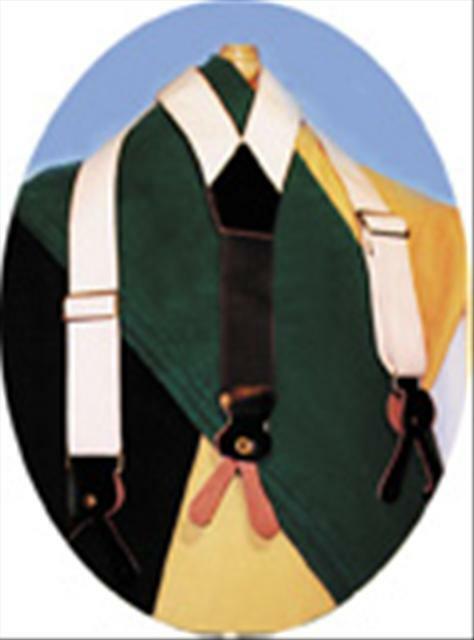 These two-inch wide adjustable suspenders are made out of quality canvas and leather ends. It features an elastic Y back. This style was worn by the US Military prior to the 1900's, including Teddy Roosevelt's “rough Riders” Perfect for Civil war and cowboy shooting reenactments. The Military, townspeople, clerks, sheriffs, riders and anyone keeping their pants up in the late 1800’s would favor this versatile style. This item is Historically authentic in every detail and proudly made in the USA by Wahmaker. Our sturdy 2" wide canvas suspenders. Y back with elastic back and leather ends. Made in usa.